I'm actually quite peeved, because the cause of my pain, misery and wretched burning was not actually even a hot pepper, as far as peppers go. It wasn't the mighty habanero that seared my entire mouth and esophagus, but the lowly jalapeno. The heat of a chili pepper is measured in the amount of capsaicin it has (in parts per million), in Scoville units. I like a nice pepper, and often fill curries with Serrano peppers (technically, like 5 times hotter than jalapenos). I have no problems with amounts of Serrano peppers in my food. But the blasted jalapeno is the most inconsistent beast. It drives me NUTS. Sometimes I buy a jalapeno and it's so mild, it's more like a bell pepper than anything else. No spice whatsoever. And other times, it's SO spicy it actually makes the food have an almost 'chemical' taste to it. It's not a tasty pepper. (Case in point: last night). So......as a sauce to go on my wraps (which were awesome, eventually), I thought it would be tasty to mix together fat-free plain yogourt and minced jalapeno pepper, thinking that the yogourt would cut a lot of the heat. Maybe it does, but not enough. I actually even attempted to bbq - the shrimp for our wraps was marinated in a yummy yogourt chipotle marinade, and then skewered and grilled. Hubs wasn't really up to grilling outside, so I decided to give it a whirl. I don't seem to have great luck when it comes to outdoor grilling (usually end up charring something beyond all recognition because I forget to go check it), and this incident did nothing to improve my track record. After what seemed like an eternity out in the arctic blast, I thought the shrimp were done (though it was FREEZING and snowing, so it was hard to see, so I brought them back inside. 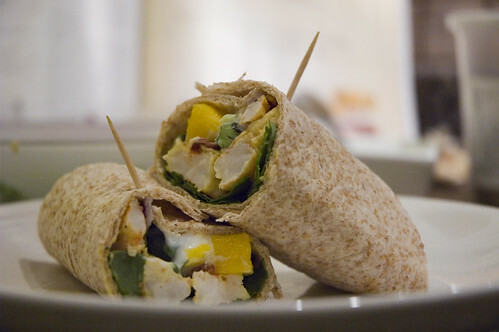 I made a very pretty looking wrap with them, but when I cut it, I could see that the little guys were not cooked enough....decided lack of opacity the whole way through. So I took the remaining shrimp and shuttled them back out onto the grill. But I didn't want to waste my yummy wrap that I'd already put together, so I decided to eat a bit of it (undercooked shrimp and all). The first bite was wonderful - tangy shrimp, sweet mango, the distinctive taste of coriander, and a pleasant, creamy bit of heat from the jalapeno yogourt. Delightful. 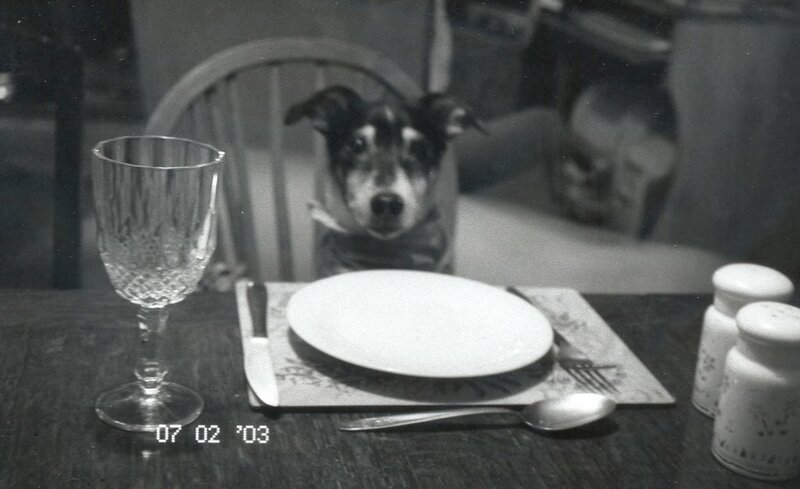 Eagerly, I scarfed down the rest of that half of the sandwich. And that's when things started to go wrong. What started as a pleasant level of heat just escalated and escalated until I actually had trouble breathing. My whole throat felt like it was swelling shut, my eyes were streaming and on top of this, the stupid shrimp were still out on the bbq. So I'm wildly grabbing the first creamy thing I see in the fridge (a large tub of vanilla yogourt) and forcing it down my throat, while grunting and gesturing to hubs to go save the rest of the shrimp. It took two pounds of yogourt and nearly 30 minutes for me to be able to talk again. All from a STUPID jalapeno. Hubs was laughing at me, and I couldn't even yell at him, because even a five second break from yogourt scarfing caused my throat and mouth to absolutely burn. It was the worst thing ever. Needless to say, my second wrap had NO jalapeno.....just plain yogourt. Hubs didn't have a single problem with scarfing down the hot peppers.....I'm not really sure why I did, as normally, I quite enjoy reasonable amounts of heat in my food.....this just wasn't pleasant though. I don't mind a burn where I sweat a little, but the whole "I think my throat is closing" feeling just sucked the big one. 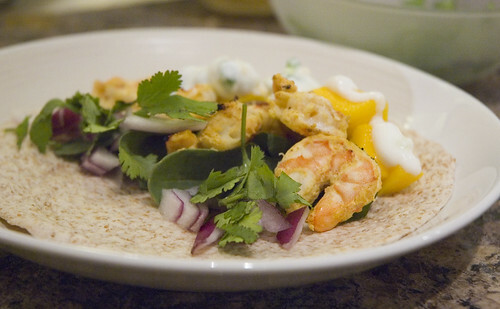 Tandoori Shrimp Wraps with Chipotle and Mango! 1. 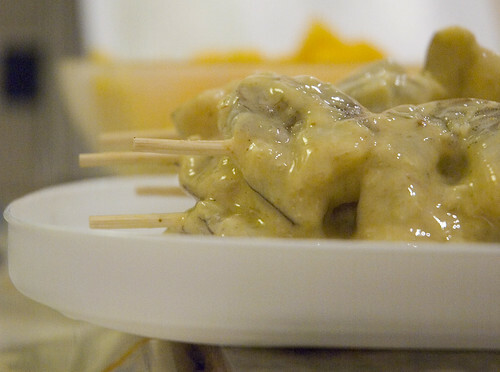 Combine yogourt, garlic, ginger, chipotles, adobo sauce, lemon and lime juices, cumin, curry powder and salt. Let marinate for 1 hour (prepare your toppings in the meantime). 2. 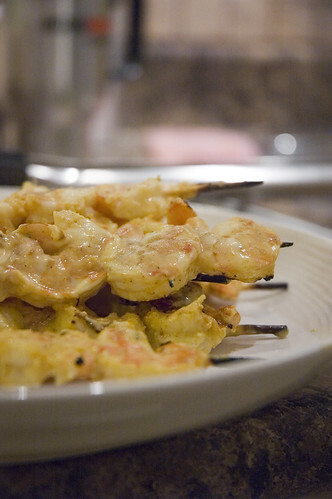 To cook, skewer the shrimp (unless you find it fun to have them all slip through the grill and burn!) and cook for 3-4 minutes per side, until shrimp are done. Here are my mostly-cooked shrimp....not quite cooked....back on the grill they went! In this picture, if you look carefully, you can see the little green pieces of jalapeno that led to my demise....my throat itches just thinking about it...gah. 1. Warm up your flatbread. Top with baby greens. 2. 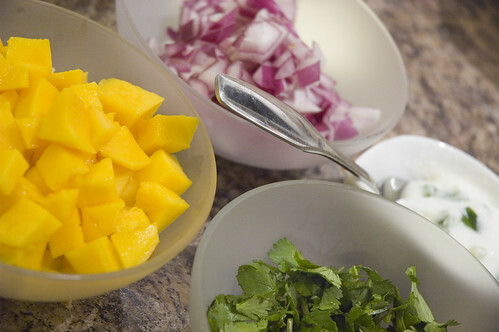 Add one skewer of shrimp (about 6-7), some mango, red onion, coriander and a bit of yogourt sauce. Again, hot peppers at your own risk. 3. Wrap up and enjoy! Oh no! I have a love-hate relationship with jalapenos because of this very reason. My near-death experience came in a restaurant we frequent often. Same place, same dish, same peppers... or so I thought. The mushroom cloud floating over my plate should have been the dead give away. This looks and sounds incredible! What a great combination. Have you ever tried sugar to cut the heat of peppers? Works like a charm. ;) :) Sorry about your jalapeño hell! What is it about jalapenos? I agree - you never know how hot they will be until you bite. The shrimp look so good though. Nice post - nice blog. I have the same problem with peppers. I really do wonder what makes them so inconsistent. Either way... your wraps look incredible!! Well, I have similar woes with jalapeno peppers. I find that the day I bring them home from the market they are not so spicy, but if they are left in the fridge in a ziplock bag, their spiciness intensified dramatically. Sometimes they are so hot that the dish is hardly edible. Also, the last batch I bought, the peppers were MASSIVE. Thick, juicy and plump. And they were SPICY. I always thought the smaller the pepper, the spicier it would be..